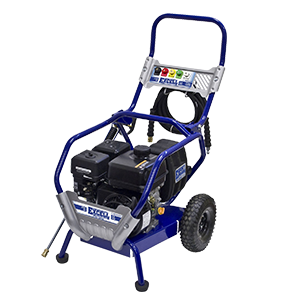 Excell 3100 PSI pressure washer is perfect for tough, professional cleaning projects. On board hose extends a lengthy 35-foot for user convenience and heavy duty roll cage frame protects all vital components on the pressure washer. 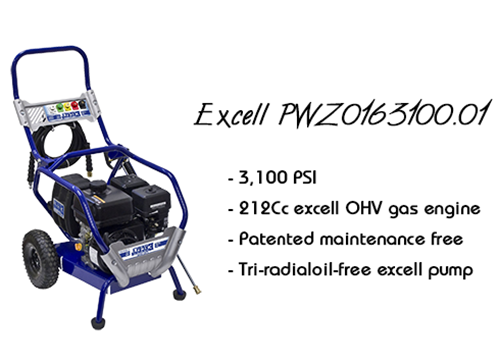 Excell PWZ0163100.01 like other Excell brand of pressure washer is strongly built and well stocked with all necessary features that will enable it to deliver perfect cleaning result. Read on to know more about this model of Best Excell pressure washer. In the first instance, the machine is equipped with 212Cc excel OHV engine which is powered with gasoline. The high performing engine is capable of producing a pressure of 3,100 PSI. Such a high pressure is suitable for difficult home and tough professional cleaning jobs. With it, you will be able to rid any object or surface of stubborn stains. Cleaning with this machine is stress-free. The machine maintains strong stability or balance on the ground. When the engine is working and vibrating, the machine will not fall because it comes with two rear tires and two legs in front. With the two legs and rear tires, it is well balanced on the ground. The tires make for great mobility. It has a strongly constructed handle. Just hold the handle and pull the machine in case you want to change the position. But you may not need to move the machine to and fro when you are working with it. This is because it is equipped it with a lengthy hose of 35 feet. The hose is long enough to make cleaning easy for you. You may only have to contend with the dragging of the hose when you are cleaning. Excell PWZ0163100.01 is strongly made. It comes with tri-radialoil excel pump which is patented maintenance free. The ergonomic wand of the unit is rust resistant and features a good assortment of 5 spray tips. You will find it difficult to identify the nozzle tips because they are available with color coding. Each tip is meant to satisfy a particular cleaning need or meant to be used on a particular application. Make sure that you choose the right nozzle tip suitable for the application you are cleaning. Excell PWZ0163100.01 offers some benefits to users. If you own this machine, you will get the following benefits from it. It is easy to use thanks to the numerous features it comes with. The engine operates very well and delivers good power which can eliminate paints from decks, wood siding and bricks. The pressure washer has just got only one review in Amazon though it has got some reviews in other site. Some reviewers have complained that the power generated was not up to 3100 PSI as stated in the product specification. A consumer also noted that the hose was 25 feet in length rather than 35 feet length stated in Amazon. Excell PWZ0163100.01 can be used to carry out various types of cleaning jobs such as paint removal from brick, deck cleaning, patio furniture cleaning, car washing and others. Its 10 pneumatic tires offer users awesome maneuverability and mobility. It may be an option for you if you are looking for a gas powered pressure washer. Before ordering for a pressure washer, make sure that you visit our site in order to read reviews of various brands and models of pressure washers. Our reviews are highly informative and will help you to make an informed decision as to which option is suitable for you.